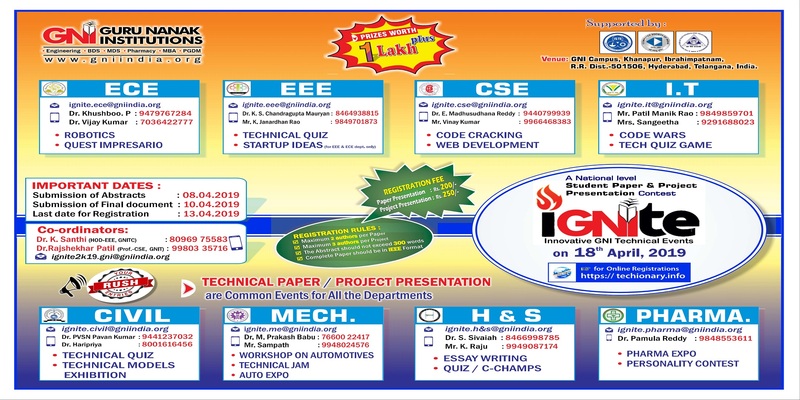 IGNITE 2019 is the NATIONAL LEVEL Student Paper & Project Presentation Contest. IGNITE (Innovative GNI Technical Events) is a yearly organised event in Guru Nanak Institutions. It involves participation of hundreds of students across the nation every year. This year it includes Paper & Project Presentations on National level along with other technical workshops for the betterment of students in technical field. GNI Campus, Khanapur, Ibrahimpatnam, R.R. District-501506, Hyderabad, Telangana, India.